The LifeSaver Bottle 6000UF lives up to its name- “LifeSaver!” This water bottle is a MUST-have for any outdoor enthusiast or explorer. As an avid traveler with an active lifestyle, this water bottle has been a game changer for both me and my family. 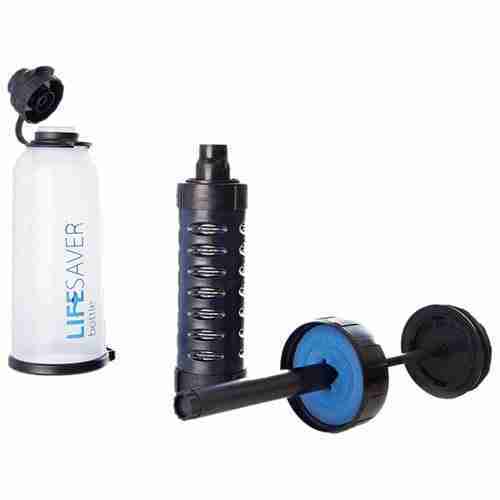 The LifeSaver bottle 6000UF allows you to use water from natural sources; lakes, ponds and rivers. It protects from waterborne bacteria, viruses, parasites, or cysts and allows you to drink water, even when there are no seemingly reliable sources of nearby. After testing this water bottle I knew immediately this was a quality product that would change all my future hikes and outdoor adventures. The bottle is made of a BPA and BPS free material, and comes with a carrying strap—which means no more lugging heavy bottles of water on long hikes! The motto “FILL. PUMP. DRINK.” was right on. There’s no measuring, or guesswork. This bottle can be filled with 6000 litres of water through a replaceable cartridge. I was so impressed with the taste, but most importantly, the purity of the water! Knowing I could thrive and survive if I were ever in a situation where my purified water source was cut off gave me such peace of mind. The LifeSaver 6000UF is a must for the outdoor enthusiast, or to keep on hand for any emergency situations.